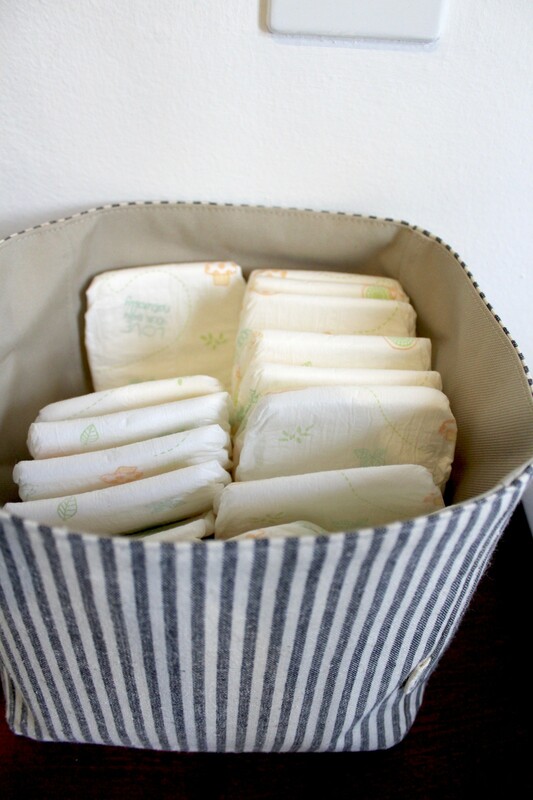 A couple of weeks ago I posted Cloth Diapers 101: What you need to get started. 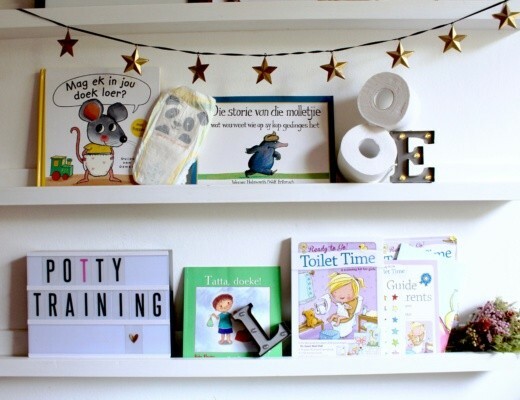 Today is part two and I’ll be giving you some tips and advice on how to set-up a cloth-friendly changing station. Yes, it takes a little more planning than with disposables but I think we’ve pretty much perfected it this second time round. This is a post for mama’s planning on going cloth full time. You’ll need a stash of at least 15 covers and 30 inserts. (This is what works for us seeing as the bamboo inserts we prefer takes some time to dry. 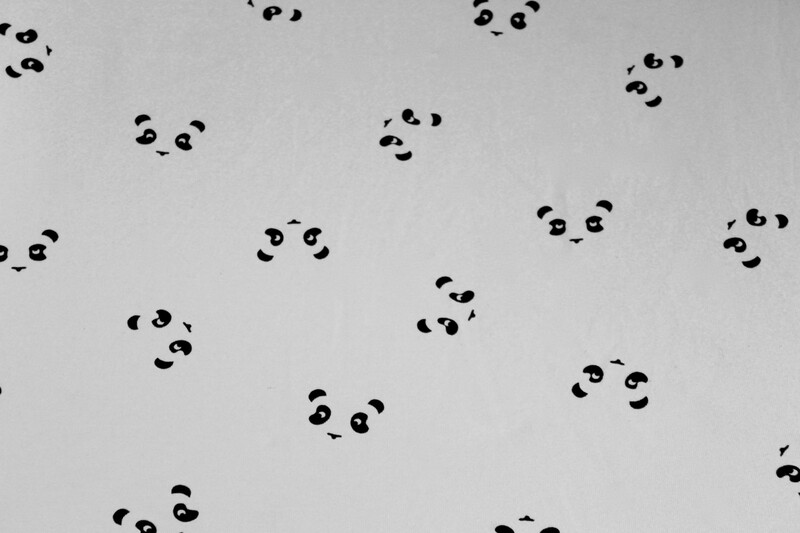 The covers however is dry is no time.) 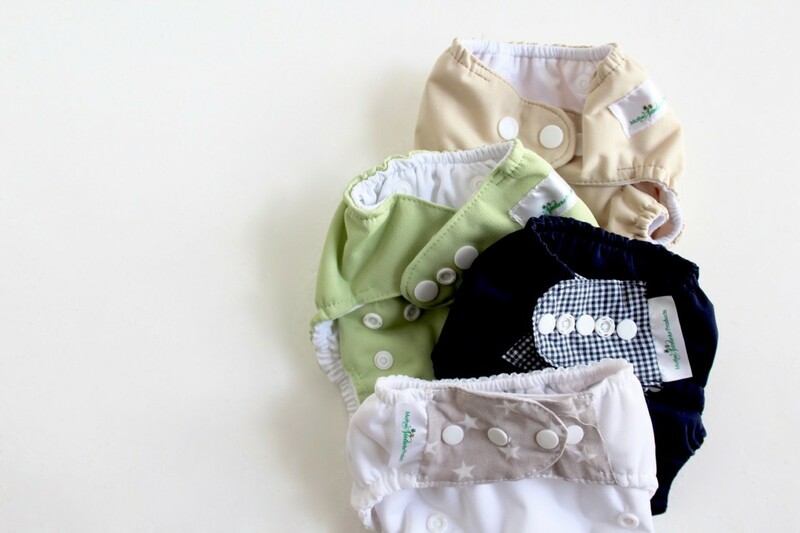 – We wash every other day, 3 times a week, but more on cloth diaper care in our next post. Let’s start with the basics for all changing stations. 1. A compactum – I’m not a fan of the overpriced, “real” ones sold by baby retailers. We’ve always just gone with a functional thrift store find. – take a measuring tape along and make sure the top surface is big and wide enough to fit your changing mat. – look for something with at least 2 drawers and extra storage space for other baby essentials. 2. A changing mat and 2 removable covers – it’s always handy having an extra when the other is dirty. 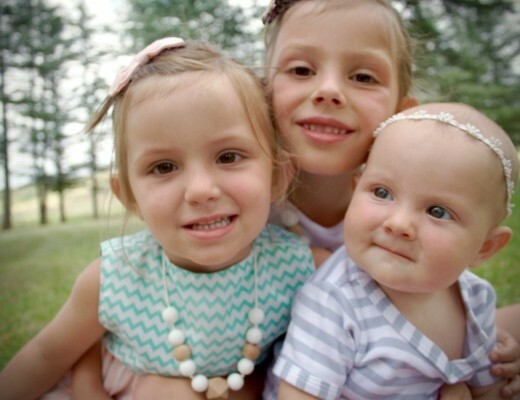 We love the cute designs from XOXO Baby, available online and at Kids Emporium. 3. 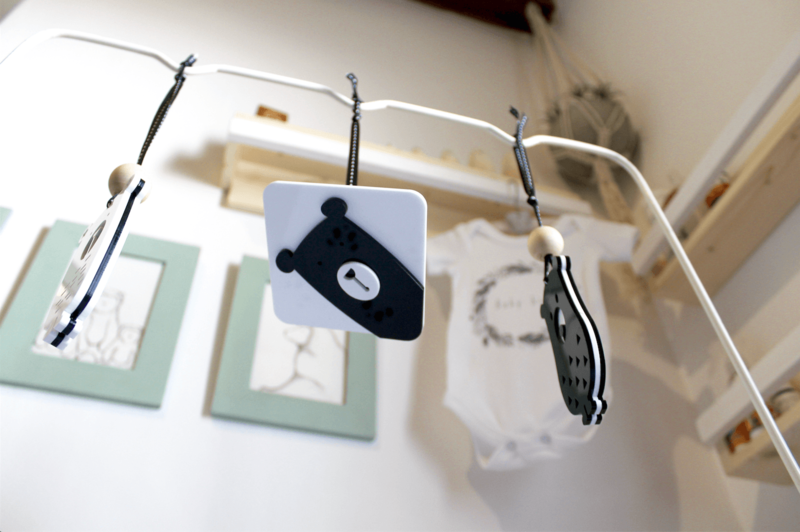 A mobile or play gym to keep baby occupied while you do diaper changes. Remember, your little one will probably be alert and awake during this time so don’t miss this perfect opportunity to get in some stimulation. 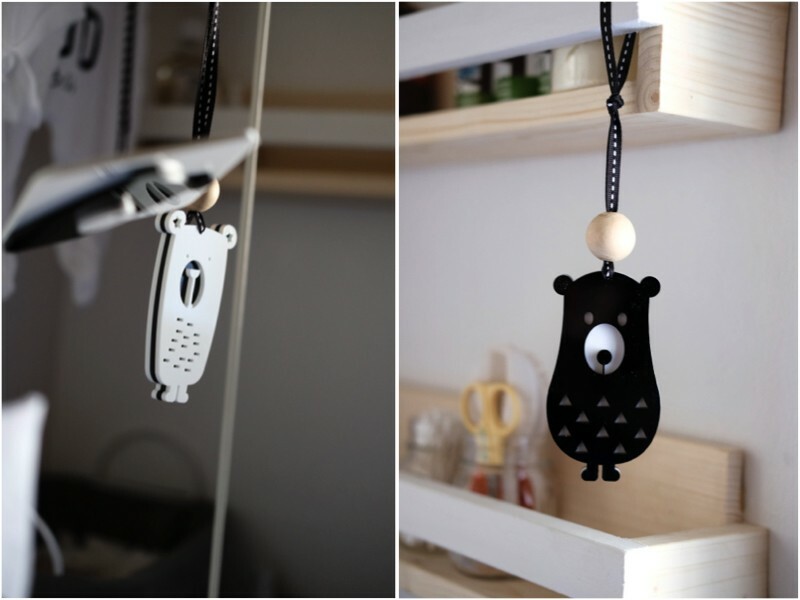 We, but especially Ava, is completely obsessed with the amazing high contrast Little Me mobile dangle range by Little Interiors. (We love them so much, I’m currently working on an entire post just about them so keep an eye out). Optional: I like to add extra storage space above the compactum for other bits and bobs. The Olly Polly Coloured Strip Book Ledges are great for this. 1. The inserts: seeing as we have more insert than covers I like keeping them at hand, rolled up neatly in a pretty basket on top of the compactum. – a lot of mamas prefer storing their diapers already assembled but I find it bulky, taking up too much space and also, I never have time to do this. 2. The covers: these are folded up neatly and stored in one of the drawers. Folded up, they hardly take up any space so I can also store my wet nappy travel bags and tea tree oil in that same drawer. 3. Liners and the other extras: all of these go into drawer 2. 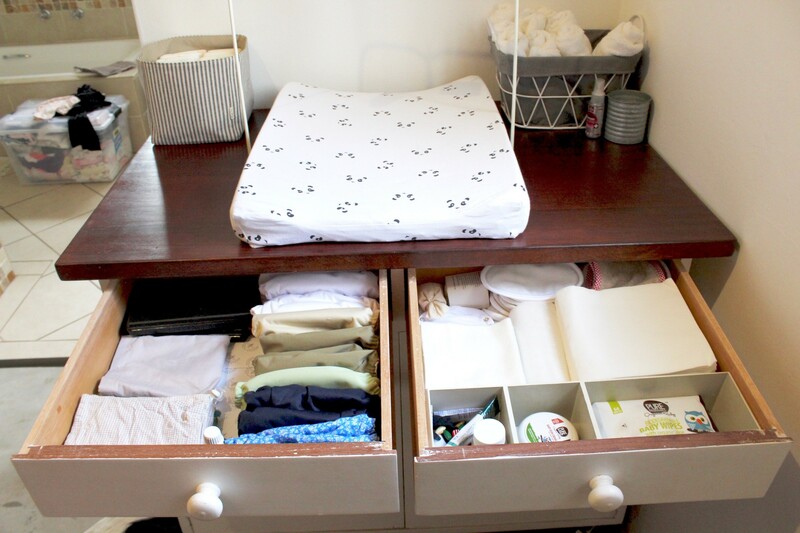 A handy wooden drawer divider we found years ago at the MamaMagic Baby Expo can easily be popped on top of your compactum or inside one of the drawers. It helps to keep things together and in it’s place. (Similar plastic ones are available at Builders Warehouse or you can just create your own making sure to leave a space for your wet wipes and bum cream.) Our divider has 3 sections and we use the 3rd space for odds and ends like nail clipper etc. Our disposable and washable nappy liners as well as our booster pads and vest extenders are stacked into neat little piles, easily accessible. 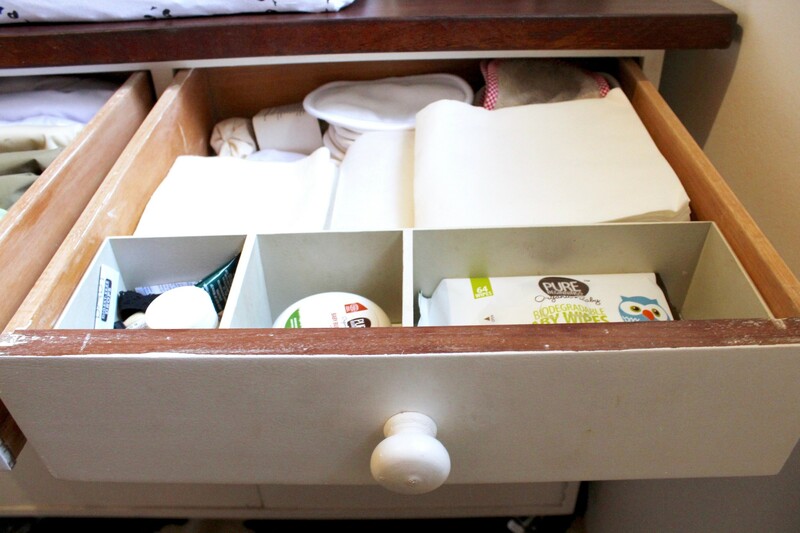 Inside the cupboard section of the compactum you’ll find extra wet wipes, bum cream and disposable liners for the month. It’s also where we keep Ava’s blankets, wraps, swaddles, toiletries, towels and other bath time goodies. It’s great for my breastfeeding covers, pads and pump too. We make use of a 2 bucket system. 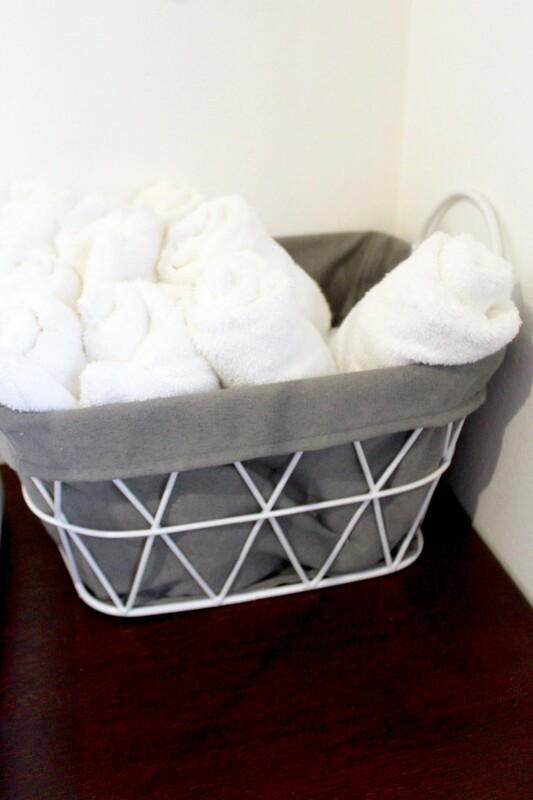 Bucket 1 (a cute bin we bought at Mr Price Home) is used to hold the wet and soiled nappy covers (we rinse and apply stain remover if needed, add a few drops of tea tree oil too if you like). Bucket 2, a plastic one available to purchase from Mother Nature Products, is filled with water and 5 drops of tea tree oil and a tablespoon of baking soda. We use this bucket to pre-soak ALL of our inserts, wet and soiled – it’s the hyper hygiene mama inside me. More care tips to follow soon. Remember: Being a cloth mama can be challenging at times with rainy days and stomach flu causing your supply to run low. Have a pack of disposables handy in case of emergency. 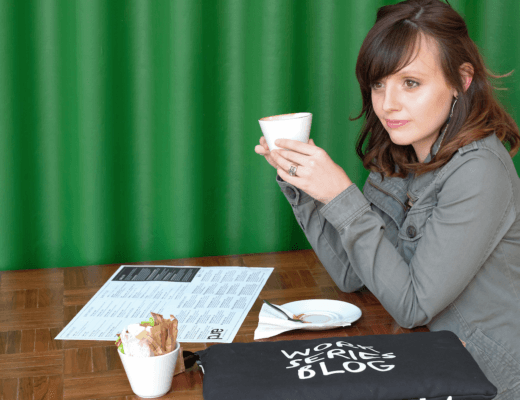 Our favourite “green” band is Bio Baby Eco Disposables available from Mother Nature Products and Faithful to Nature. And that’s it, changing station set-up complete, functional and neat with everything at hand. Hope this helps to get you organised and remember to click on all the pretty pink links included in this post; they’ll take you where you need to go. If you missed our previous post regarding our favourite cloth diapers we’ve been using over the past 3 years just click HERE. Also keep an eye out for our next post concerning cloth diapers care and which product to work best with cloth, ensuring years of use. I wish I’d had advice when I had my babies. I was completely clueless and went for the disposables. Thanks for the insight. It’s so interesting to read about cloth nappies. I loved the first post and this one too. It’s amazing how much planning we have to go into and organizing for our tiny ones. Can’t wait to start this journey again next year. 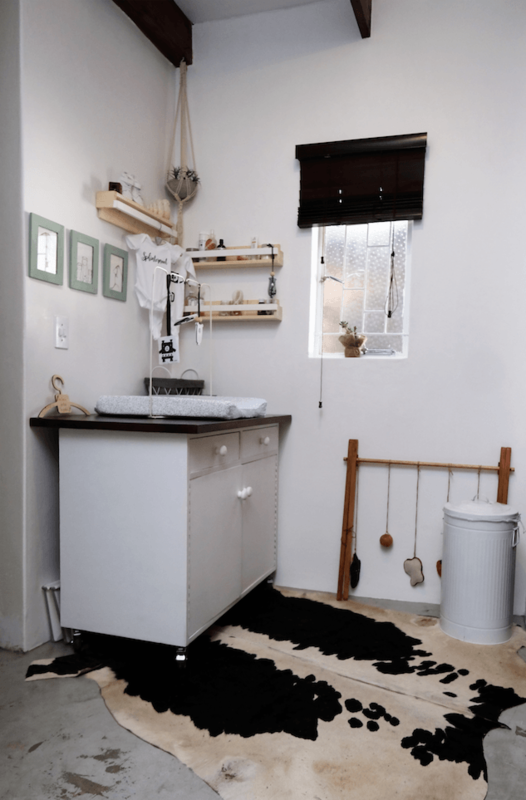 Hi, I live in CT and would love to use cloth nappies but I am worried that the worsening water restrictions and low pressure will make it difficult due to the extra washes for nappies and baby clothes. How many extra washes a week do you do for the nappies? Hello Lindsay. Sorry for the delay in response. I wanted to give you the correct feedback so I contacted the manufacturers, who also live in Cape Town. Our next post in this series will be all about laundry care so please be sure to have a look at that too.